JAYAPURA (Voice WestPapua/Pacific Media Watch): Eighteen more Papuan students have been arrested in a crackdown by Indonesian authorities in Jayapura, activists report. "We received urgent news that 18 students have been arrested. 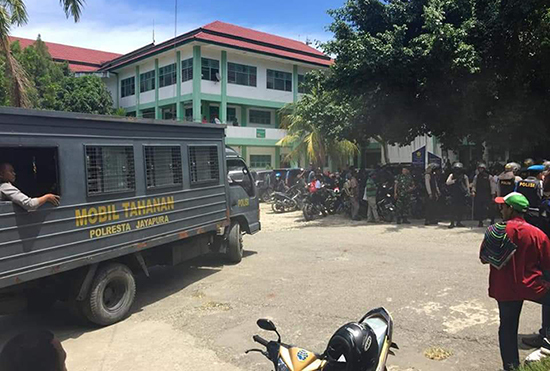 "Witnesses report that some have been taken away from the direction of the police station in Jayapura and are headed towards Koya. Also disturbing, another group has not been taken to the police station, but to an unknown location toward the beach in Abe. "Among those arrested is Pilipus Robaha, deputy chair of SONAMAPPA (National Solidarity Youth and Student Movement), who was interrogated by a Jayapura chief of police intelligence unit a few days ago." This follows the reports of 67 Papuan students being arrested earlier in the week for taking part in demonstrations in support of Vanuatu taking up the issue of West Papuan self-determination at the United Nations.